Day Six - Project 365 - Nekaro & Co. There I was standing at my back door in my pj's, wrapped up in a throw cover from the living room, waving bye as my kids got on the bus this morning. As I came back inside, I could have sworn I was hearing my cell phone ring.... at 7 o'clock in the morning. I thought that it must have been a wrong number, but it wasn't. It was the school library calling to ask for my superb volunteering skillz. That's skills with a Z 'cause I'm so awesome. I immediately thought what a great opportunity I was going to have to take some photos for the Project 365. 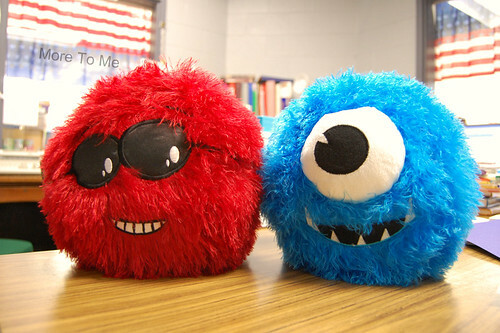 The librarian has these cute little monsters to award to the 1st grade class who earns the most AR points each month. 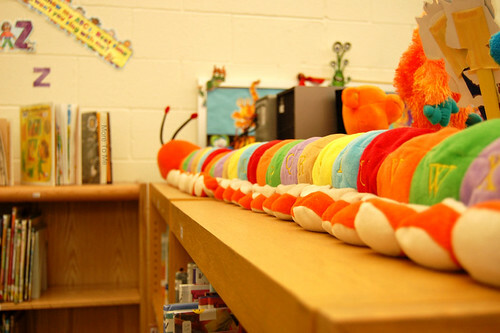 The classroom that wins gets to take care of them for the month. I spent my day gluing it up in the library making visors for kids from construction paper. I made 97 visors! See? I told you I was awesome.